Renowned for its glorious beaches and islands, bountiful marine life, a unique cultural heritage and arguably the world’s friendliest people, the Philippines is fast becoming THE destination of choice for divers, sun worshippers and adventurous travellers alike. The ZuBlu team have been fortunate to explore much of the Philippines - from Luzon in the north to Davao in the south, and everywhere in between - so if you are looking for a spectacular adventure, exploring the reefs and islands of this fascinating country, then read on and discover why ‘It’s More Fun in the Philippines’. Forming the northern tip of the Coral Triangle, the Philippines has some of the best scuba diving in Asia offering the chance to encounter ocean giants and the smallest of critters. Given everyone has their own diving preferences and the Philippines simply has so much to offer, it seems a little unfair to rank these different destinations. Instead we decided to offer up a little bit of inspiration - so whether you are dreaming of big animals, would like a bit of everything, craving a critter fix or wish to escape from it all, then our selection of perfect Philippines dive destinations has something to inspire everyone. Only accessible by liveaboard for a few months of the year, Tubbataha Reef Natural Park is an isolated, 100,000 hectare World Heritage site in the middle of the Sulu Sea. With over 600 species of fish, 300 coral species and huge populations of barracuda, jacks and other schooling fish, Tubbataha could already claim to be the crowning glory of the Philippines. However, it is the reliable encounters with whale sharks, manta rays, thresher sharks, hammerheads and even tiger sharks that take the diving here to another level. Liveaboards make the 14-hour journey from Puerto Princesa between March and early June when sea conditions are calm enough. Expect challenging but incredibly rewarding diving. Image courtesy of Solitude One. Great for: Big fish and beautiful reefs! The Tubbataha Reefs are home to more big animals than any destination in the Philippines. Best time to visit: March to June. The reefs’ exposed location in the middle of the Sulu Sea means liveaboards can only visit during a brief window of calm from March to June. Best place to stay: There are no resorts in the area and if you would like to dive the reefs, you’ll need to book a liveboard trip well in advance. 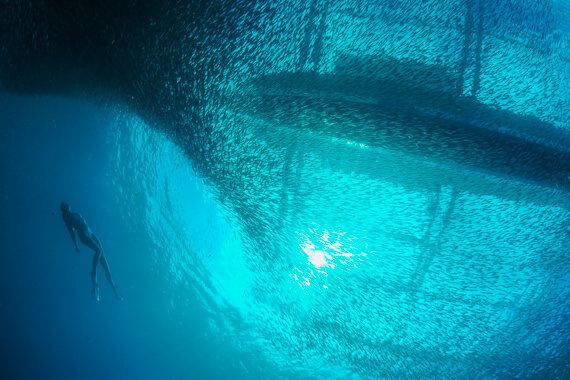 Pretty much every diver has heard of South Africa’s famous Sardine Run, but did you know you can also encounter huge schools of sardines in the Philippines? Tucked away in the heart of the Visayas and the site of some of the Philippines’ best reefs, Moalboal is home to dense schools of sardines that hug the coast at Panagsama. Throw in the beautiful beaches, dramatic wall diving, prolific marine life and a fantastic, laid-back atmosphere, and you’d struggle to find a better destination if you’re looking for big schools of fish and an exceptional Filipino dive experience. Great for: Schooling, coral walls and a welcoming, laid-back vibe. Best time to visit: November to May, when the weather and visibility are at their best. Best place to stay: Moalboal has plenty of great options to stay around Panagsama and White Beaches. 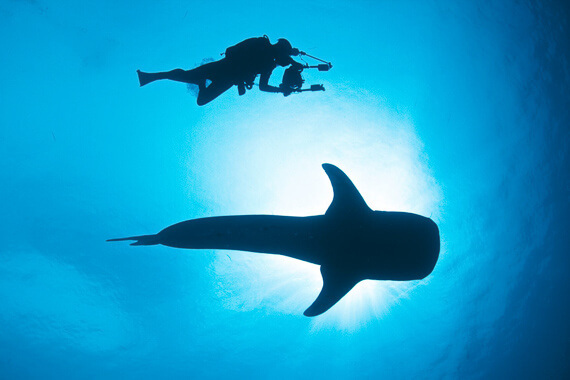 Famed for the resident thresher sharks at Monad Shoal, Malapascua is high on the bucket list of most divers. However aside from the unique opportunity to see these stunning and elusive sharks, Malapascua has a lot more to offer for divers of all persuasions. The island itself is surrounded by interesting reefs filled with unusual species and some surprisingly good muck diving - including a great mandarinfish dusk dive. Nearby Gato Island has some incredible reef structures as well as a tunnel filled with whitetip reef sharks running under the island. Combined with some exceptional resorts and beautiful beaches, Malapascua is best described as an epic, all-round dive destination! Image courtesy of Solitude One. 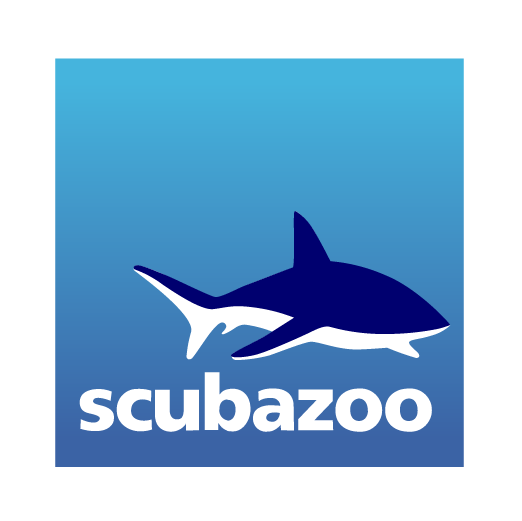 Great for: Thresher sharks, and consistently good all-round diving. 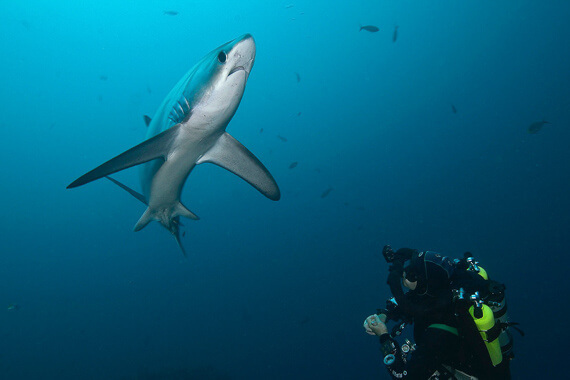 Best time to visit: Thresher sharks are seen all year, but our recommendation would be to visit from February to May, when the weather is fantastic and there are fewer visitors. Best place to stay: Most of the accommodation is concentrated around Bounty beach in the south, but there are plenty of different options to choose from all round the island. Puerto Galera is a series of modern day pirate coves and beaches hiding a wealth of underwater ‘treasures’. 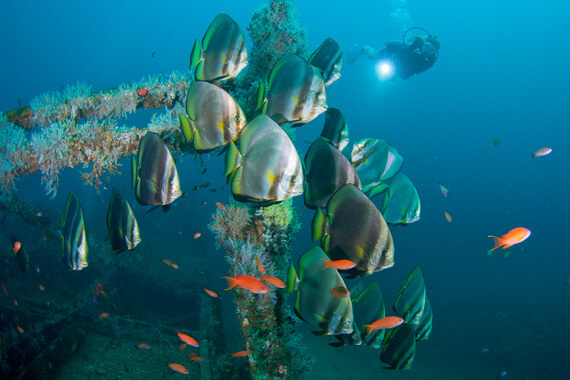 Reefs in front of Sabang are great for muck-diving and the wrecks in deeper water are home to schooling batfish, giant frogfish and plenty of other marine life. Critters such as flamboyant cuttlefish and mimic octopus are found on the sandy rubble around Paniquian and Media Islands, whilst to the east, around Escarcio Point, you can explore some of the areas best dive sites – with pygmy seahorse, swim-throughs and healthy fish life all waiting to be found. Day trips to Verde Island take you to some the best reef diving in the Philippines where you can explore remarkable topography, enormous sea fans and carpets of soft coral covered with thousands of anthias. Overall, Puerto Galera is an excellent dive destination with something to offer both the complete novice and the seasoned professional. Great for: Great reefs, wrecks and interesting muck diving, along with plenty of nightlife. Best time to visit: December to April is the best time to visit, but Puerto Galera can get busy around Christmas and Chinese New Year. Best place to stay: Puerto Galera has a huge range of different options to choose from - including resorts, apartments, villas and big hotels - however ZuBlu recommends staying at a resort that offers in-house diving services and have reputations for professionalism and customer service. Alona Beach is a lively holiday resort on Panglao Island renowned for its nightlife, beautiful sandy beaches and great diving. Nearby Balicasag and Pamilacan Islands offer the best underwater experiences where you’ll find exceptional reefs and abundant marine life. But Alona is also an ideal base to explore the rest of Bohol - including nights safaris in search of endemic Tarsiers and visiting the spectacular Chocolate Hills. For divers looking for nightlife, a beach lifestyle and some great side trips, Alona is the perfect destination. 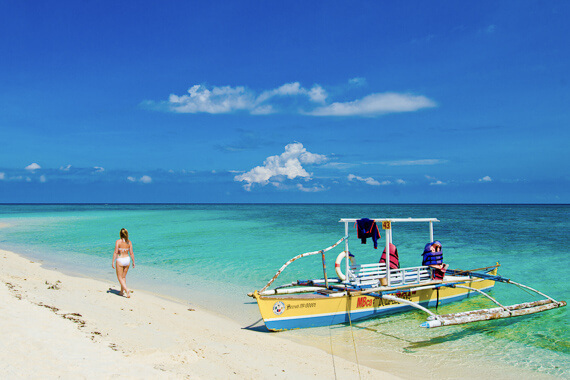 Great for: Great beaches, nightlife and some fantastic diving, particularly at Balicasag and Pamilacan Islands. Best time to visit: November to May, with the busiest times around Christmas and Chinese New Year. Best place to stay: Alone has plenty of different accommodation, from homestays to big resorts. With its renowned marine biodiversity, healthy reefs and abundant marine life, Anilao is regarded by many as one of the best dive destinations in SE Asia, particularly for macro-lovers and muck diving enthusiasts. 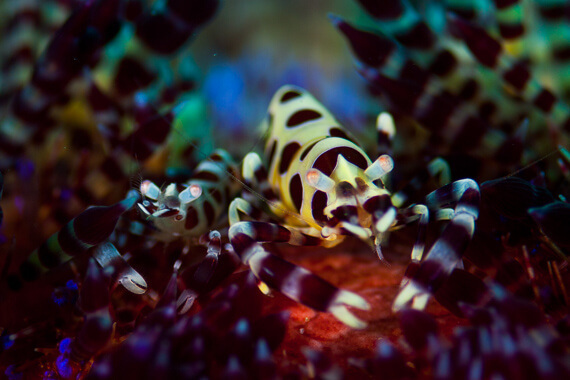 Many of Anilao’s resorts have been set up specifically to cater for photographers in search of the areas incredible critters, which can include Rhinopias, hairy frogfish, hairy shrimp, blue-ringed and wonderpus octopus - all in a single trip. With its easy access from Manila, divers can head down for a long-weekend or book an extended stay to fully appreciate the wealth of incredible critters that have made this destination so famous. Great for: Muck critters galore, as well as some very pretty reefs. Best place to stay: Most resorts are small and low key, and there are also plenty of private villas and guesthouses to book. And if you are a photographer, Anilao has several great resorts set up specifically to cater for you and your cameras! Located in the southern Visayas along the heel of Negros Island, the waters around Dauin and Dumaguete reliably provide some of southeast Asia’s best encounters for critter-loving enthusiasts. Its gently sloping sand plains, dotted with coral patches, are home to the rare, the bizarre and the ugly. From yawning frogfish to camouflaged ghostpipefish, mating flambuoyant cuttlefish and hunting coconut octopuses, Dauin is a dream location where you’ll soon start to tick off lots of those ‘must sees’ from your diving wish list. 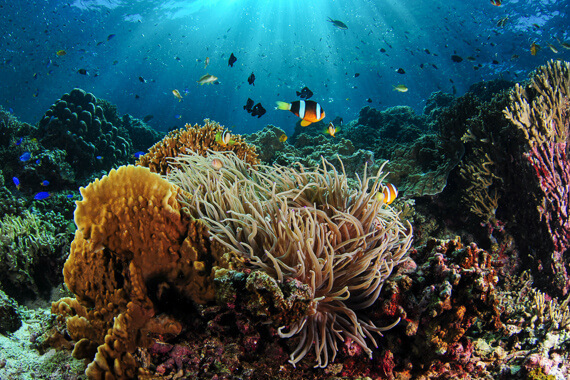 Aside from muck diving, nearby Apo island is surrounded by coral walls and bustling reefs, and makes a great day trip. Just 30 minutes on a traditional Filipino bangka, you’ll have a great chance of encounters with large schools of jacks, plenty of turtles and even the occasional roaming pelagic - a testament to the conservation efforts that have protected these reefs for so long. And keep an eye out for the volcanic gases bubbling up through the sand - it’s not every day you can say you have dived a geothermal vent! 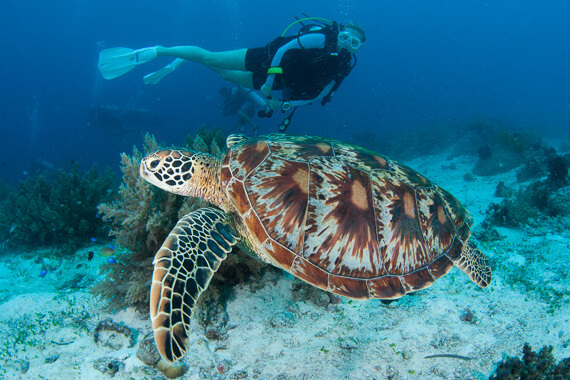 Great for: Fantastic muck diving along the coast at Dauin, plus great reefs and lots of turtles at nearby Apo Island. Best time to visit: November to May. The start of the season is normally very good with plenty of critters. Best place to stay: Tourism is still very low key but there are some very good dive resorts that offer great accommodation and in-house diving services. With its volcanic peaks towering over the centre of the island, visitors to Camiguin soon understand how the island’s dramatic geological history has helped shape this beautiful island. However, visitors today can explore a more peaceful landscape of natural springs, beautiful beaches and pristine sandbars, along with some interesting underwater landscapes and great muck diving sites. And yet for all these beautiful attractions and the great diving on offer, Camiguin remains one of the Philippine’s best-kept secrets - offering tranquil escapism for those seeking unique dives, stunning hikes and eco-friendly retreats. Great for: Unusual dive sites, exploring a beautiful volcanic landscape and enjoying the laidback island lifestyle. Best time to visit: November to April, when the weather is at its best, although would recommend visiting Camiguin year round. As the island is so far south, any typhoons that strike Luzon or the Visayas normally have less impact. Best place to stay: Tourism is still very low key and guesthouses and very small resorts are the norm here. Pick one that matches your budget and preferences as you can dive and explore the island from anywhere. Consisting of 1,780 islands, this stunning archipelago stretching from the tip of Borneo to Mindoro Island is often thought of as the last adventure frontier of the Philippines. In the north World War II wrecks can be found around Coron Island, earning the island its reputation as a mini Chuuk lagoon. But even with so much exhilarating diving on offer, it is the stunning limestone karst landscape and the private eco-retreats that will fill your soul and linger in the mind. 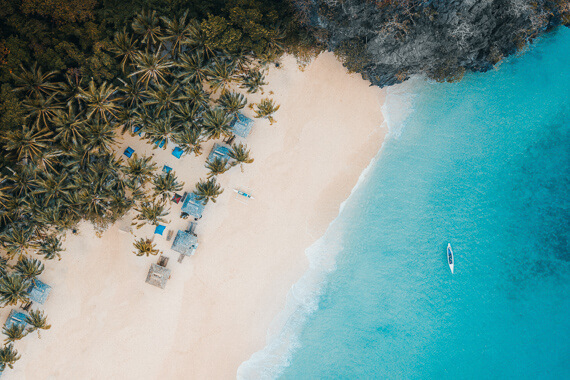 Long after you have flown out, you’ll still remember snorkelling in turtle sanctuaries, hiking through forests filled with unique species, exploring an underground river in Puerto Princesa and kayaking through hidden lagoons. In fact for adventurous travellers, Palawan is THE top destination in the Philippines, if not all of Asia. Great for: Stunning landscapes, wreck diving, eco-retreats and turtles. Best time to visit: The long chain of islands has distinct weather patterns of its own. The north, west coast and far south have the typical dry season that runs from November to May, followed by 6 months of wetter weather. The driest months are normally March, April and May. The east coast has a shorter three month dry season normally from December or January to March, and a much less pronounced wet season. Best place to stay: Palawan has an incredible variety of accommodation options, including some fabulous eco-resorts that have a well-earned reputation for leading the way in sustainable travel.